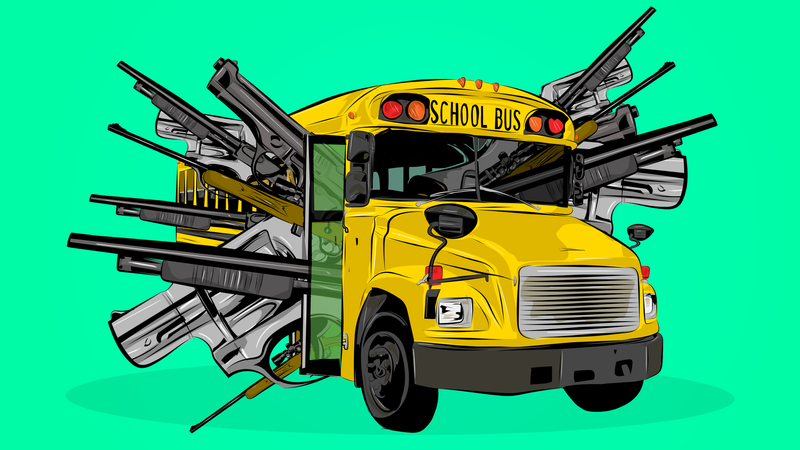 What Do I Do With My Dead Father-In-Law's School Bus Full Of Guns? My husband’s father passed recently. His wife needs help paying off medical debts, so we were discussing an estate sale. The grey area I’m concerned with is his weapons stash. There is a school bus full of various guns and ammo on the property. I thought about just calling the auction house and seeing what they could do with them, but I’m worried that there could be illegal items in the collection. Is there a way to take care of it without any of us getting into legal trouble? I have no idea what’s in there. I need to go catalog. Condolences on the passing of your father-in-law. You’re facing the unpleasant reality of not only losing a loved one, but also dealing with some complex post-death legal procedures. Plus, apparently, you’ve got a school bus full of deadly weapons and their explosion-driven projectiles-in-waiting. This is a new one on me, both legal-issue-wise and gun-wise. (And, I guess, bus-wise: My knowledge in this area is limited to the Merry Pranksters’ Furthur bus, the Partridge Family Bus—which effectively gave birth to the cultural blight of Danny Bonaduce—and School Bus #29 of the Ball-Chatham School District, where I re-learned daily that hell is other children.) But it’s important to note that this question isn’t really about busses or guns. It’s about death, what your father-in-law did to prepare for it, and the resulting consequences. Did your father-in-law die with a will or without a will? I’m going to assume that either his will gave the collection to his wife, or, if he died without a will, the law of his state provides that all of his stuff goes to his wife, including his yellow school bus wrapped around an enviable Guns & Ammo spread. If you’re in a community-property state, and if the weapons were acquired during their marriage, the wife already probably had an ownership interest, but the guns were probably not registered in her name. On the flip-side of the issue, we have to see if a person inheriting something is legally allowed to own it based on what the thing is. For example, if someone’s will and testament wants to give a toddler a car, that’s just not going to happen, because toddlers can’t own cars (except the Matchbox variety). Federal laws generally prohibit certain people from owning guns. This list includes, among other things, fugitives from justice, domestic abusers, and, of course, spies (that’s bad spies, not good spies like James Bond and such). So we need to assume that the wife is legally cleared to own guns. Alright, so we have a school bus loaded with compact carriers of lethal force. And your mother-in-law is the legal owner. What is the best way to check to see that these are all legal firearms? The most cautious approach would be to have a lawyer run serial numbers with a local reputable gun dealer. States then vary on what you need to do with an unregistered firearm (or, like, dozens of them), and also on whether all gun transfers need to go through a licensed dealer. Older guns deemed to be antiques under law are exempt from registration. So if you’ve got a bus full of muskets, congratulations—I hear those are hot right now with the small but enthusiastic hipster contingent of the NRA. Your mother-in-law will likely not get into trouble with an unregistered gun that would otherwise be legal to own. There will probably be issues, however, if there are guns that are never legal to own. Working with a lawyer and a reputable gun dealer, she should be in a good position to determine what can be sold and what will need to be surrendered to law enforcement. Once all that is cleared, she’ll need to determine whether a gun needs to be registered to her before it can be sold to a third party. I can’t stress this enough: Your mother-in-law should use a good estate lawyer here. It’s going to cost some money, but an estate lawyer can help navigate the massive amount of red tape required to determine whether the guns need to be registered in her name before sale, and then to help handle the sale paperwork required for what sounds like a large collection (and to coordinate with the dealer). Before any of that though, she needs to determine the disposition of her husband’s estate and its assets. Hopefully, afterwards, she’ll wind up with a nice, empty, weapons-free school bus, which she’ll be free to use for something—anything—else. Ask a Lawyer is a practicing lawyer with over 15 years of broad legal experience. He is part of the team at Unwonk Podcast and can be found on Twitter. Keep in mind that this is general information, and not formal legal advice or legal representation; if you need any of that, you should get it from a lawyer in real life, not an internet column. A legal problem is serious and fact-specific, and you should treat it accordingly. But you have common sense and already knew that.